It could have been subconscious at work. Or it might have been a happy accident, since I’d been listening to The Stones the day before and it was still queued up. Or maybe, just maybe, it was providence. 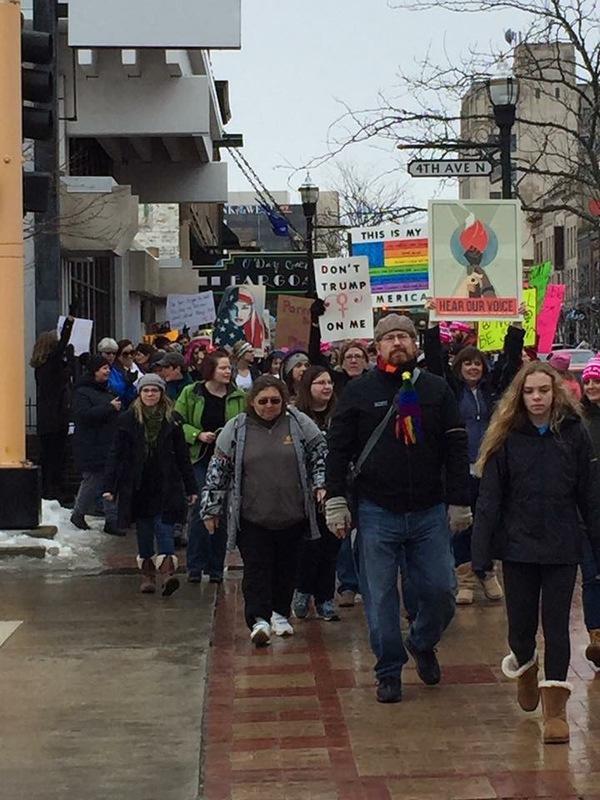 / As I turned east from University Drive onto 7thAvenue North on Saturday, January 21, headed for the Fargo, N.D., edition of the Women’s March, the stereo was kickin’ out “Pass the Wine” full blast. It could have been subconscious at work. Or it might have been a happy accident, since I’d been listening to The Stones the day before and it was still queued up. Or maybe, just maybe, it was providence. 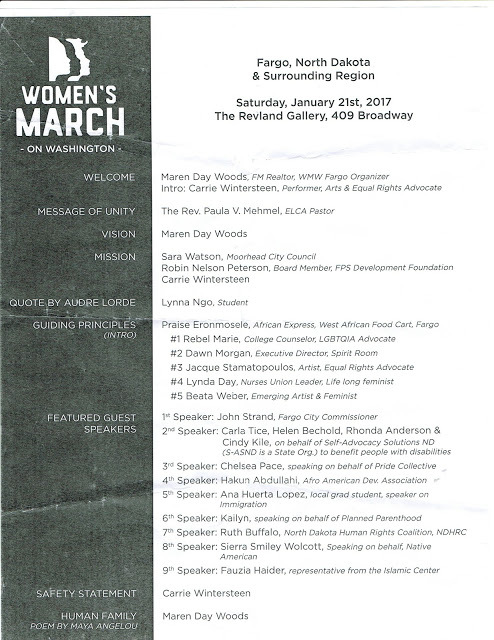 As I turned east from University Drive onto 7th Avenue North on Saturday, January 21, headed for the Fargo, N.D., edition of the Women’s March, the stereo was kickin’ out “Pass the Wine” full blast. I was early, but there were already a couple hundred people in The Revland Gallery and Theatre B, eating cookies, drinking coffee and waiting for the program to begin. It was a cold day by Washington, D.C. standards, perhaps – 33 degrees F – but in Fargo that’s nearly short-sleeve weather. I had to get out of the building; too many people generating too much heat. As I made my way out behind Theatre B where a stage awaited the featured speakers, first a trickle, then a stream, then a flood of people came from all directions. The local newspaper reported a turnout of around 1,000, but I’d have put it between 1,200 and 1,500. No matter. It was a bunch of people for this moderately conservative city and highly conservative state. There was a buzz in the air. Excitement. Simmering anger. Chagrin. Camaraderie – yes, definitely camaraderie. It was a pretty good bet that the next person held the same beliefs, cared about the same things, shared similar concerns for the future. Lots of “Yeah!” and cheers at what the gathering thought ought to be, and a “No!” or two at the mention of things moving in ways someone in the crowd didn’t believe they should. Clapping, crying, laughing, smiling, snarling… it was all there. Unity, too. 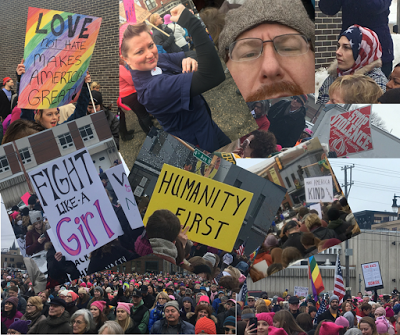 After all, the walk was about reaffirming the rights of women, LGBTQIA people, artists, immigrants, refugees, people of all colors, every single AMERICAN (even those with whom we don’t agree) and every community member who wants to be one. It was about protecting our precious and precarious environment. And it was about peace and understanding, not violence and closed mindedness. After the speeches, Carrie Wintersteen, the event’s MC, offered time on the stage to anyone in the crowd or within earshot who wanted to provide an alternative view. No takers. Down Broadway from 2nd Avenue to NP Avenue and back. Moving lines of marchers took up the sidewalks on both sides of the street, chanting back and forth, cars honking as they drove through the raucous but peaceful throng. As for me, I held both arms high and flashed peace signs to fellow marchers and passersby. It felt good to reaffirm my Americanness by exercising my 1st Amendment rights. I had just finished reading about the Sean Spicer press conference where he, on behalf of the country’s new president, argued there had been more people at the inauguration than the press was reporting (petty). Also fresh in my mind was the video of Kellyanne Conway saying that Spicer, on behalf of the country’s new president, was providing “alternative facts” (dangerous). After telling my daughter about the march, I reiterated some of the things my wife and I have been saying to our kids since mid-July 2016. Everyone deserves the same opportunities and respect as everyone else, no matter what they look like. Caring for and taking care of other people are among the most important things in life. It’s not OK to make fun of other people no matter what they look like, how they dress or what abilities they have. You can achieve anything you put your mind to if you’re honest, work hard and treat others the way you want to be treated. To those, I added a new one: There’s no such thing as an alternative fact; that’s only a misleading label for a falsehood or untruth. Just then a favorite song came on the radio. She knows it from the movie “Chicken Little,” I know it from listening to AM radio in the 1970s. We are the champions, my friends / And we’ll keep on fightin’ ‘till the end / We are the champions, we are the champions / No time for losers ’cause we are the champions / Of the world. We danced around the room together, high fived and sang loudly out of tune. Thanks, Queen, for the exclamation point of my weekend. Right will prevail, not because of anyone’s might, but because the truth is the truth is the truth, and an “alternative fact,” no matter how you dress it up or how much lipstick you put on it, is still akin to a lie. We ARE still alive and kickin’. And no matter what happens, we are the champions. Next Next post: Jobs? All It Takes is a Huge Setta Ball… Gags. Trump’s got ’em!